Merrimac Solutions attended the GMIS conference in November 11, 2017. At this event we offer free virtualization and backup assessments at our booth! GMIS GIANTS is a three day seminar full of opportunities to network with your peers, learn about new and exciting trends in local government technology, meet with industry leading vendors and enjoy some light entertainment. Twenty Six suburban based companies and business organizations have been selected as honorees of the 28th Annual Awards for Business Excellence (AABEs). The AABEs are presented in recognition of business achievement, growth and community involvement. The award recipients will be recognized at a reception beginning at 4:30 p.m. on Thursday, March 29, 2018, at the Danada House in Wheaton. The recipient companies and organizations will be profiled in a special publication of the Daily Herald Business Ledger published on April 23, 2018. AURORA -- Information technology services firm Merrimac Solutions was recently named to the 2017 Inc. 5000 list, which ranks the fastest-growing companies in the United States. It is the first time the firm has made the annual list, ranking 4,770 with $2.2 million in revenue in 2016 and a three-year growth rate of 47 percent. 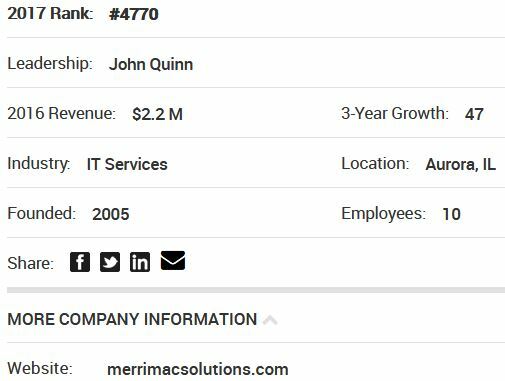 John D. Quinn (CDM MS '07) is president of Merrimac Solutions, which was named #4770 on the 2017 INC 500 list of the fastest growing companies in the United States. Merrimac Solutions is an enterprise cloud infrastructure provider based in Aurora, Ill. Provides managed cloud and data management services to health care, manufacturing, and distribution companies. Shaun McCoy, from left, Greg Kachoris, Brenda Quinn, John Quinn, principal of Merrimack Solutions in Aurora; Marilyn Weisner, Aurora Area Interfaith Pantry executive director; Hans Ashman and Natalie McDaniel gather together to present a $500 donation check from Merrimack Solutions to the Aurora Area Interfaith Food Pantry. In addition to the donation, Merrimack Solutions also sent a team of six volunteers to distribute food to visitors during a recent visit.